The idea of this product is to help your students learn their math facts in a semester. You can take this at a pace that fits your students’ individual needs. Some might breeze through this more quickly than one semester. Some might need longer than a semester. The average is expected to be about a semester. Ideas included are as follows: anything added to zero is just the number added itself, adding one to any number just makes it one greater than it was before, adding 2 to an even number makes it the next even number, adding 2 to an odd number makes it the next odd number, adding 10 to any number results in a 1 in the 10’s place and the other number in the one’s place, adding 9 to a given number makes it 10 plus one less than the number added. Commutative property is also covered. There are ideas to help learn the numbers that don’t fall under these strategies. This product was developed to help my own students learn their addition facts in one semester, and then put to the voice of one of my beloved pets: Goliath, sometimes known as “The Nose,” because he likes to sniff EVERYTHING! 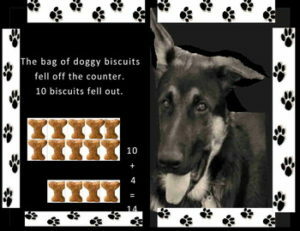 Included is a PowerPoint presentation featuring none other than my beloved “The Nose,” as he teaches how to learn the addition facts through doggy bones. Following the presentation are practice sheets where students can apply what they’ve learned from the Power Point, as well as addition fact tokens to help them practice the math facts that are a little harder to learn (and review the ones that weren’t so difficult). It is not suggested to go through the Power Point all at once, but to introduce a group of math facts a little at a time. Once they have shown mastery of one group (or concept) then you can move on to the next group or concept. The Power Point presents the concepts, and are followed by practice sheets to help you evaluate their mastery of each concept before moving on to the next concept. The tokens are included to help students practice particularly difficult math facts, and are suggested to use with fruit loops, cheerios, or beads – – to make learning these math facts more involved for the visual and kinesthetic learners. PLEASE ASK QUESTIONS before purchasing. I do not want you to be dissatisfied.